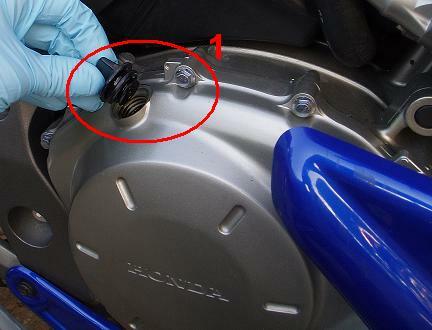 This DIY describes how to change engine oil and oil filter on a 2007 CBF1000A Honda motorcycle and is applicable for 2006 to 2009 models. This is one of the easy DIY tasks. A first timer may spend 1-3 hours doing it, an experienced 15-30 minutes. API classification: SG or higher (except oils labled energy conserving on the circular API service label). oil filter (Honda part number 15410-MFJ-D01). sealing washer for oil draining bolt (you may reuse the old washer e.g. one time if in good condition). Drive the mc a short tour to warm up the engine (the oil will drain quicker then). Put the mc on center stand on a level surface and place something below to absorb any oil spill. Also have some rags available for drying up any larger amount of oil spill in case that should happen. 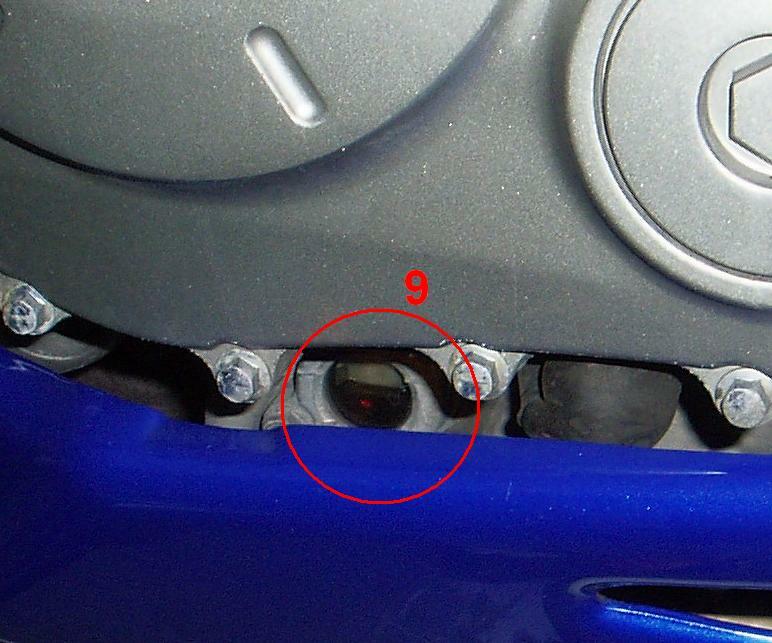 Clean the oil inspection window (9) and the areas arround the drain plug and the oil filter cover. If you have pressurized air available it is a good idea to use this to blow away any dirt which may hide behind the oil filter cover. OBS: Cleanleness is of utmost importance here. Make sure all surfaces around the drain plug hole and oil filter hole are cleaned thoroughly using a soft cloth, and make sure no dirt drops inside the engine. Remove the oil filler cap (1) and check that the O-ring on it is in good condition. 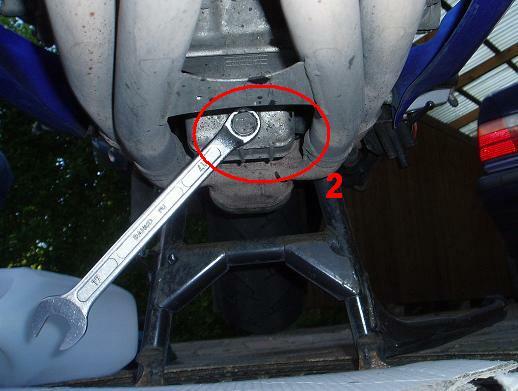 Loosen the oil draining bolt (2) using a 17 mm spanner, place a container below and unscrew the bolt with your fingers. Be carefull on the last turn. The hot oil will come pouring out in forward direction. Remove the two bolts (3 and 4) which holds the filter cover in place and remove the filter cover (5). 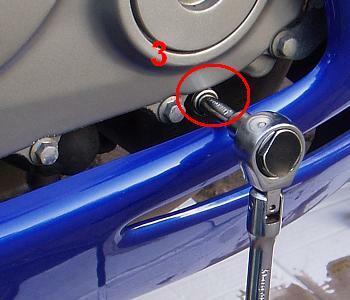 You can reach bolt (3) with a top wrench as shown on the image below. 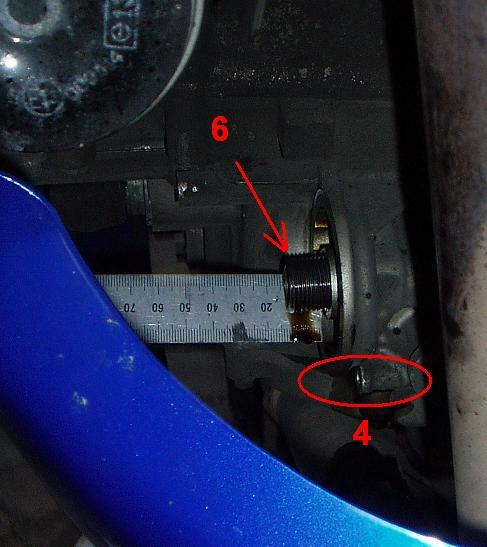 Bolt (4) can be reached from below using a ring spanner. The filter cover can with some patience be wriggled out past the cowling. 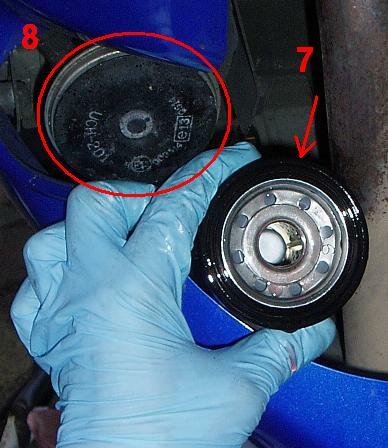 Place the oil filter wrench on top of the oil filter (7) as shown here below. 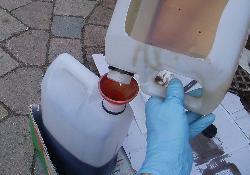 Place the oil container so you can drain oil from the filter when it comes loose. Then unscrew the filter and let it drain empty. 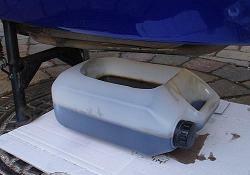 Be prepared for some extra outflow of oil from drain hole when the oil filter comes loose. The oil filter can be removed through the front opening in the cowling. Looking through the front opening of the cowling, check that the oil filter boss protrusion from the crankcase is within a 14.4 - 15.4 mm range as shown on the image below. The Honda service manual does not explain what to do in case this measure is not within range, but I assume from looking at the construction drawings, that the boss can in some cases go loose and need retightening. In case anybody out there knows the explanation, please drop me a mail about it. Apply som clean engine oil to the O-ring and to the thread on the new oil filter. Ease the filter (7) through the opening in the cowling next to the horn (8) and screw it onto the boss. Make sure it engages correctly to the thread of the boss. It sould not in any way be nescesary to use more force than you have in your fingers. The final tightening to 26 Nm (2.7 kgfm, 19 lbfft) should be done using a tourge spanner and the Honda oil filter wrench. Using a new sealing washer smeared with clean engine oil, reinsert the oil drain plug and tighten it to 30 Nm (3.1 kgfm, 22 lbfft). OBS: Make sure the bike is on center stand on a level surface while performing the final steps. This is to ensure correct level indication in the inspection window. 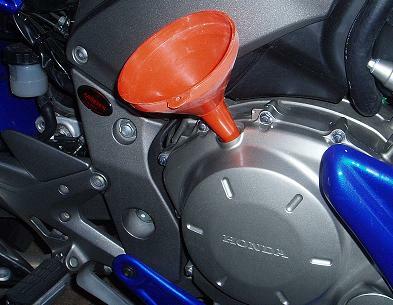 Using a funnel, poor in 3 liters of new engine oil. Continue adding oil slowly untill the level reaches halfway up the oil inspection window (9) an then install the oil filler cap. Start the engine and make sure the red oil pressure warning light turns off after only a few seconds. If it does not turn off, shut down the engine immediately and recheck oil level. You should never let the engine run if the warning light is on! Let the engine run arround one minute and stop it. Wait a minute to let the oil level stabialise, then top up the oil level untill it is again in the middle of the inspection window. Repeat the sequence (idle engine one minute - stop and wait one minute - check the oil level - top up to middle of window) a couple of times untill you do not need to top up anymore. Clean all surfaces for oil remains and take the mc for a short ride. 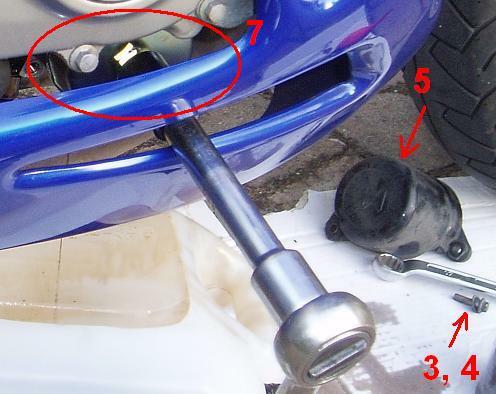 After the ride check for any signs of oil leaks at the drain plug and oil filter. See this thread on the www.cbf1000.com forum for reviews, comments and discussions about this DIY article.